An Oregon owned business. NO SALES TAX! The many qualities of the ADAPTABLE FENCE EXTENSION ASSEMBLY (Patent Pending) also referred to as : the HIZAP Insulator Fence Extender, The HIZAP Fence Extender and the HIZAP Insulator. 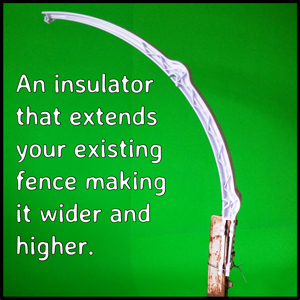 The HIZAP insulator/fence extender is designed with many functional advantages. This sturdy, U.V. protected plastic insulator extends the height and width of new and existing fences. 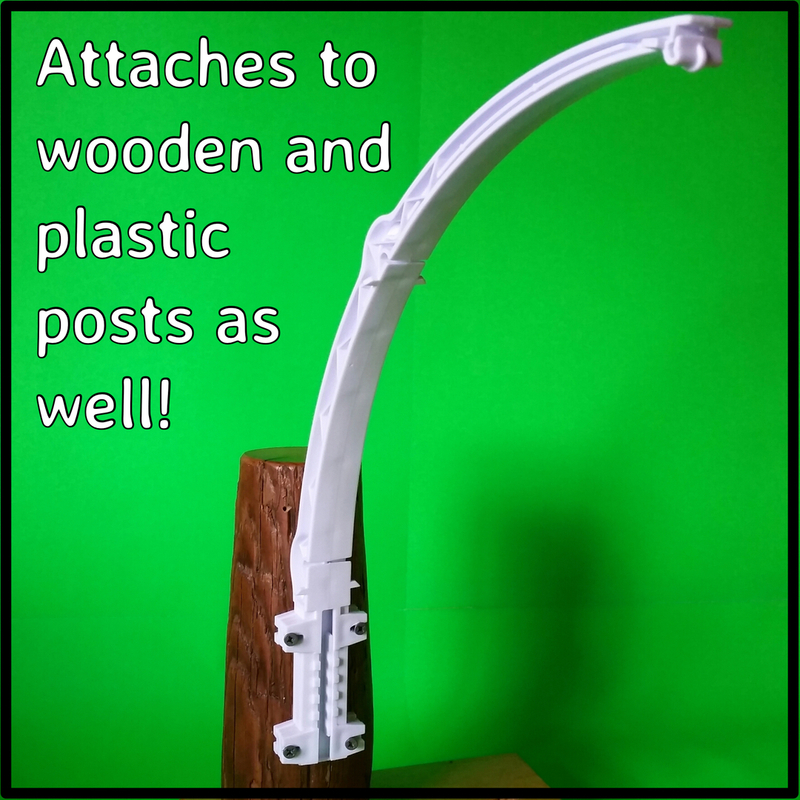 It's been proven to adapt easily to different types of fence posts, it's easy to install and replace and has an attractive arched shape. The HIZAP insulator helps protect: crops, pets, livestock, poultry and hives. It can retain a number of different conductors such as: electrical wire, cord or tape and visible deterrents such as flags and ribbons. It will help keep out: dogs, coyotes, raccoons, opossums, bear, deer and elk. When extended towards an enclosure it will deter livestock from escaping. The HIZAP insulator can be used in conjunction with other electric fence insulators used in lower regions of a fence and at the fence corners. While most fence insulators are designed for a specific need or type of post, the HIZAP insulator/fence extender fills many needs. It heightens a new or existing fence by 12" while at the same time providing a 12" outrigger that better deters jumping and climbing predators. When a small shim is installed between the tines of the insulator, it easily converts from placement on a T post to positioning on a wood or plastic post.